Have just purchased a 12v negative ion generator, for the guts of a DIY static grass applicator. The two output leads are identical. Do any of you know if polarity is critical here, or can either of them be used as the ground? I've never used or built an electrostatic grass applicator, but I know the important thing is the voltage, which should be fairly high. In theory, the polarity shouldn't make any difference. I am not sure if an "ion generator" is going to have enough power to generate a static field. I looked at data sheets for a sub $5 unit, which I found on eBay, imported from Hong Kong. The unit appears to have four wires. One Black for DC 'ground', one Red for DC 'plus'; & 2 White which would appear to be the High-Voltage side of the unit. 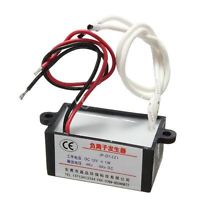 In reading a little about them, they are a form of inverter which uses DC voltage to produce AC. I am sure internally, the unit is using some sort of switched-capacitor circuitry to do this. 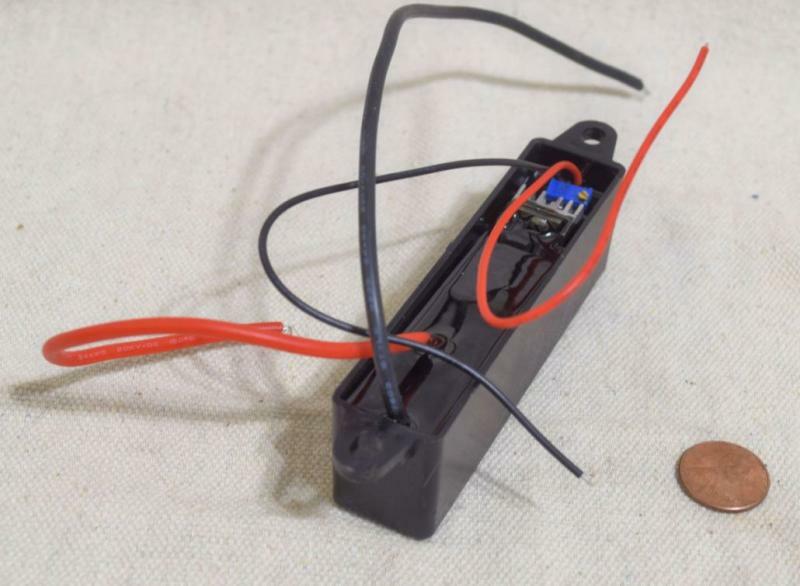 It is a fairly common technique, used for example on boats and in RVs to obtain household type power from the 12v batteries. Since the two white leads are producing AC (I assume), they have no polarity. Without knowing the specifics of what you have, I am basing this on my background in electrical engineering. Take a look at the units on eBay and see if yours looks similar. Some of the application notes I looked at, caution against using more than a 9v battery as a power source. Having no clue as to what you are planning to do and how you plan to do it, I can offer no advise on wiring or safety considerations. I do know that I stay out of color TV sets because of large voltages stored in the circuitry that moves the electron beam over the picture tube. Those circuits can exceed 50,000v which is enough to really upset your day if you happen to hit it by accident. High voltages can be very dangerous if proper precautions are not taken. Kent, It is one of the imported Hong Kong units. In the instructions for construction of the applicator I have, the ion-generator only has three leads DC+ & DC- and 1 High Voltage output. The instructions use the High Voltage to the mesh & a feed taken from the DC- for the ground pin. My generator has two High Voltage out leads. As this build involves high voltages I am thinking I may be a bit out of my depth! High voltages alone are not the main problem. Combination of voltage & current yields power. That is the biggest issue I have when I think about the High Voltage sections in color TV sets. There are storage capacitors in those circuits, that will keep charge on them. Further, even when discharged, they want to charge back up, even with the power switched off. Some capacitors have a memory effect, whereby they remember and want to retain the voltage levels impressed upon them. The units I looked at on eBay were exactly like the unit your photo showed. They clearly have 4 leads. Notice in your construction diagram that 4 wires are coming out from the ion generator module. I would suspect that one of the white output leads is tied to the DC ground. I haven't looked at data sheets for the 'oatley iona 2 ion generator', but I would suspect that it also has the same 4 leads. You might try a search on your favorite search engine, with the part number of your ion generator & see what kind of information you find. I'm interested in DIYing one of these units, as I think the prices charged for ready to run units is excessive considering what is in them. But I feel that way about lots of things in the model world. I model the Maine 2 footers in S scale. I have learned to build from scratch, because there's no choice if I want certain iconic features. They could be ordered from a custom builder, but I am retired and have much more time than money. If there are specific questions you have, I'll do my best. I don't want to discourage you from building this. Just recognize you're dealing with circuitry designed to do the same as shuffling across carpets & hitting a door knob or something else that is grounded. Your body WILL conduct electricity and sometimes you must have some respect for it. ahhh .. bringing a thread back from the dead. I purchased a couple of Negative Ion Generators off of eBay with the hope that they would have at least SOME data. Nope. No part numbers .. nada. The eBay page says ..
DC 12V to 20000V 20KV High-Voltage Electrostatic Generator Negative Ion Generator. These have two thick wires on one end .. black and red and two thin wires on the other end, also black and red. My guess is the two thin wires are the 12 Volt input and the two thick wires the HV output. Black ground and red positive? Will experiment .. with rubber gloves.